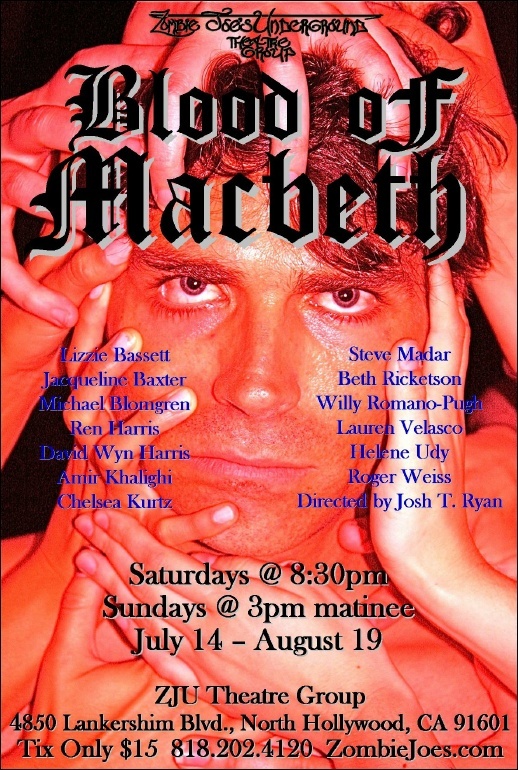 Zombie Joe’s Underground Theatre Group celebrates their 20th anniversary season with their high-impact, post-apocalyptic, re-imagined Shakespearean spectacular, Blood of Macbeth, steeped deep in greed, ambition, magic, and murder. Directed by Josh T. Ryan and starring Lizzie Bassett, Jacqueline Baxter, Michael Blomgren, Ren Harris, David Wyn Harris, Amir, Khalighi, Chelsea Kurtz, Steve Madar, Beth Ricketson, Willy Romano-Pugh, Lauren Velasco, Helene Udy, and Roger Weiss. July 14 – August 19, 2012. For tickets ($15) call 818-202-4120.